WAKADO: Another Air Quality Problem Fron Steam Pipe Explosion In NYC / Between 9/11 And The Latest Explosion Is It Safe To Breath In NYC Anymore ? Another Air Quality Problem Fron Steam Pipe Explosion In NYC / Between 9/11 And The Latest Explosion Is It Safe To Breath In NYC Anymore ? 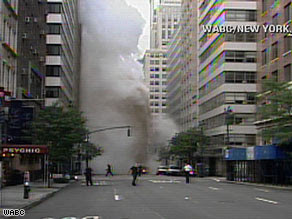 NEW YORK (CNN) -- The air was declared clean, but the carcinogen asbestos was found in dust and debris hurled into midtown Manhattan by a steam pipe explosion the day before, New York City announced Thursday. The city's Department of Emergency Management will continue to test the debris after finding asbestos in six of 10 samples, according to a statement from the city's Office of Emergency Management. Asbestos is a fibrous mineral used to insulate pipes. Longterm exposure can cause allergies, skin problems and cancer.